Description: Here is a photo by an unidentified photographer that was taken in Northumberland, Pennsylvania, on 17 October 1954. Shown here is Pennsylvania Railroad engine #7688, an H-10S (2-8-0) "Consolidated" built by the Lima Locomotive Works during January of 1915 and presently on display at the Railroad Museum of Pennsylvania in Strasburg. Raymond C. Laws Collection; #7 of 18. Description: RRMP. Here is an original photo that I took at the Railroad Museum of Pennsylvania in Strasburg, Pennsylvania, on 30 June 1973. 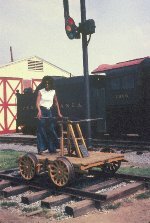 Shown here is my friend Ms. Twyla Jean King of Middletown, Pennsylvania, posing on a four-wheel handcar that was built around 1890 and owned by the Philadelphia & Reading Railroad. Partially visible in the background is Pennsylvania Railroad steam engine #7688, an H-10S (2-8-0) "Consolidated" built by the Lima Locomotive Works during September of 1915. Description: RRMP. Here is an original photo that I took at the Railroad Museum of Pennsylvania in Strasburg, Pennsylvania, on 30 June 1973. Shown here is Pennsylvania Railroad steam engine #7688, an H-10S (2-8-0) "Consolidated" built by the Lima Locomotive Works during September of 1915. Description: Here is page 12 of a 96-page monograph entitled "Power To Burn: Smoke, Steam, & Cinders" that was edited by James M. Shafer and published during 1976. Top Photo, Revised Caption: "PRR Class H-10s [#7688] was shown at Juniata prior to being sent to the Railroad Museum at Strasburg, Pa." Bottom Photo, Revised Caption: "PRR Class H-6s [#8848] was shown at Juniata prior to being sent to the Railroad Museum at Strasburg, Pa." Both of these locomotives are Class H (2-8-0) "Consolidateds." #7688 was built by the Lima Locomotive Works during September of 1915 and retired in October of 1957. Construction data for #8848 not available, and the locomotive proper is no longer on display at the Railroad Museum of Pennsylvania. 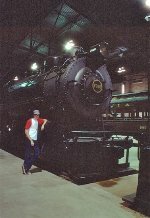 Description: My buddy took my picture with PRR 7688 inside the Strasburg RR Museum in July, 1977. With permission. 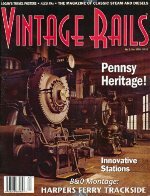 Description: Here is the front cover of a six-page cover article by Robert Emerson & Kurt Bell entitled "The Pennsylvania Railroad's Historical Collection." It was published originally on the Fall 1996 issue of "Vintage Rails." Photo Caption: "Don Wood's photo shows three historic Pennsylvania Railroad locomotives in the Northumberland Roundhouse in March 1966." Shown here (L to R) are PRR engines #7688, #2846, and #460; all are presently on display at the Railroad Museum of Pennsylvania. #7688 is an H-10S built by the Lima Locomotive Works during 1915. #2846 is an H-6SB built by the Baldwin Locomotive Works during 1905. #460 is an E-6S (4-4-2) "American" built in Juniata during 1914. 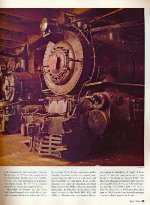 Description: Here is page four of a six-page cover article by Robert Emerson & Kurt Bell entitled "The Pennsylvania Railroad's Historical Collection." It was published originally in the Fall 1996 issue of "Vintage Rails," page 83. Photo by Don Wood (1966). Shown here (L to R) are PRR engines #94, #7688, #2846, and #460; all are presently on display at the Railroad Museum of Pennsylvania. #94 is an A-5S (0-4-0) switcher built in Juniata during 1917. #7688 is an H-10S built by the Lima Locomotive Works during 1915. #2846 is an H-6SB built by the Baldwin Locomotive Works during 1905. #460 is an E-6S (4-4-2) "American" built in Juniata during 1914. Description: Wood. Here is a photo by Mr. Don Wood that was taken in Northumberland, Pennsylvania, during March of 1966. 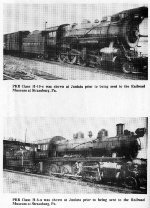 It comes from an article by Robert Emerson & Kurt Bell entitled "The Pennsylvania Railroad's Historical Collection" that was published in the Fall 1996 issue of "Vintage Rails," pages 82-83. Partial Caption: "In the roundhouse, Nos. 460, 2846, 7688, and 94 shine brightly as afternoon sunlight shows off the new paint jobs in March 1966." Shown here (L to R) are PRR engines #94, #7688, #2846, and #460; all are presently on display at the Railroad Museum of Pennsylvania. #94 is an A-5S (0-4-0) switcher built in Juniata during 1917. #7688 is an H-10S built by the Lima Locomotive Works during 1915. #2846 is an H-6SB built by the Baldwin Locomotive Works during 1905. #460 is an E-6S (4-4-2) "American" built in Juniata during 1914. Description: The Lindbergh Engine, PRR 460 (Built 1914) & PRR 7688 (Buit 1915) sit outside the museum. Description: Pennsylvania Railroad 7688 on display at the RR Museum of PA. Description: PRR 7688 sitting outside on display at the Railroad Museum of PA.